Mind Bytes from My world !!! : Beautiful Moments of our life ...Released as a movie !!! Beautiful Moments of our life ...Released as a movie !!! The best a movie experience one can get !!! Unique - Engrossing - Different - and yes .....it will leave you thinking for a looooong time afterwards....WATCH IT !! The experience of watching this sequel to Before Sunrise is different..very different.. This movie changed my weekend thoughts , plans and everything that comes with living for the moment....I just realised...I.......forget it ....!!! When Jesse (Ethan Hawke) and Celine (Julie Delpy) met on a Eurail train, the connection between them was immediate and profound. The 14-hour relationship that followed, as the pair explored the spontaneous and unexpected in Vienna, ended on a train platform where they swore they'd meet again six months later. Nine years have passed since that morning. On the last stop of his book tour, at the tail end of a reading in a Paris book shop, Jesse finds Celine watching from the back of the room. She lives in Paris now, he in New York. He's flying out that evening and they utilize every moment, finding their human connection no less vital, inspiring or real than it was in nine years ago in Vienna. In a stimulating and revealing journey through Paris, in real time, these two individuals explore the inner workings of their hearts and minds and rediscover their rare yet powerful love for the unexpected, the unrehearsed, and each other. 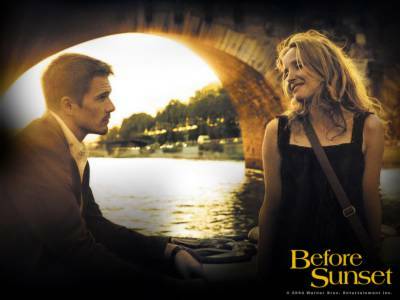 Warner Independent Pictures and Castle Rock Entertainment present a sequel to the acclaimed 1995 film Before Sunrise. Directed by Richard Linklater, the visionary behind such films as Dazed and Confused and Waking Life, BEFORE SUNSET tells the timeless romantic story of two questing hearts and minds whose powerful bond defies time and place.